Oregon Railway & Navigation Co.
Huntington is where the Oregon Short Line joined Henry Villard's Oregon Railway and Navigation Company (OR&N) on November 25, 1884. In 1887, the Union Pacific leased the OR & N and two years later bought the majority of the stock in the company. In 1910 the Union Pacific reorganized the OR&N and its other holdings in Oregon and Washington as the Oregon-Washington Railroad and Navigation Company (OWRR&N). Finally in 1936, the Union Pacific leased the OWRR&N and absorbed the company into the Union Pacific. When most people think of the Union Pacific in Oregon, two thoughts come immediately to mind: The Blue Mountains and the Columbia River Gorge. However, where Oregon meets Idaho at the Snake River on the La Grande Subdivison, the Union Pacific also has a lot to offer the visitor. After the railroad crosses the Snake River from Idaho and to Oregon, westbound trains enter Huntington. Trains entering Oregon from the East have been following the relatively easy profile of the Snake River until the railroad leaves the Snake River at Huntington. From an elevation of 2,110 feet above sea level at Huntington, the main line climbs the Burnt River valley to gain elevation to surmount the Burnt River Mountains. The summit is 37 miles to the Northwest at Encina. The ruling grade is 2.2 percent between Durkee and Pleasant Valley to gain Encina's 3968 foot elevation. Not only do trains have to contend with the grade, but there is not a whole lot of tangent track. 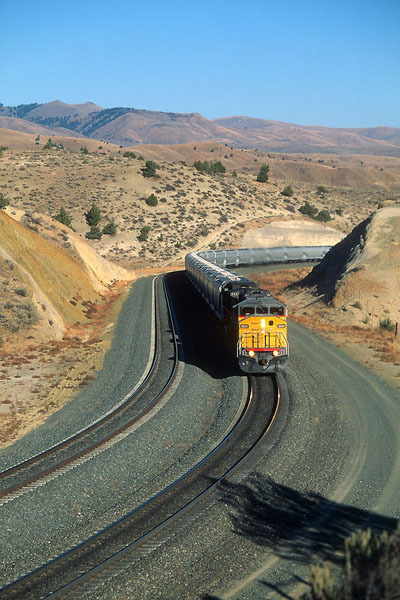 Between Prichard Creek and Oxman the railroad uses a large horseshoe bend to gain a significant amount of elevation quickly. After reaching Encina, the railroad descends to Baker at 1 percent to 1.5 percent gradient. In the last few years, the UP has added additional double track to improve the fluidity of the line. Towards the summit, the Omaha dispatcher may take advantage of the bi-directional trackage and run a faster train around a slower train to keep the trains moving. The largest project was double tracking from Prichard Creek to Oxman, including the Durkee loop. Until 1988, the Union Pacific would run long trains, sometimes with mid-train helpers (usually 5 SD-40's U30C's or C-30-7's), and helpers on the rear of the train. In 1988, the UP started to split heavy westbound trains in Nampa and run those trains in two sections with 2 engines on the front and two on the rear. This was particularly true for Soda Ash and grain trains. Starting about 1996, long heavy trains are the norm again. However, now the mid-train helpers and rear helpers are now DPU's. Currently, the big grain and soda ash trains have the DPU's about 2/3rds of the way into the train. Traffic is a mix of hot intermodal, grain and soda ash, manifest, and forest products. Additionally, it is likely that the occasional local may make an appearance. Amtrak's Pioneer followed this route from Portland to Denver until 1997. During good weather, the Union Pacific will have a major track work program going on somewhere in Oregon. The seasonal maintenance makes it hard to say when a visitor might see trains during daylight hours. Our approach to photography of the UP in Oregon has always been listen to the scanner and hope! The scenery is typical for eastern Oregon, an arid inland desert with rugged steep hillsides delineating the valleys and mountains. The area can be quite cold and the winter and very hot in the summer. The best times to visit are in the spring and fall for moderate weather. Most of the line is reasonably accessible from I-84 and local access roads, particularly the more scenic east side of the pass. Photographically, the challenge is take pictures without the freeway or a local road in your viewfinder. This area is home to rattlesnakes, so due caution should be exercised. Oregon has an excellent state park at Emigrant Springs that has camp sites that provide a good view of the action as the UP runs on the Idaho side of the Snake. Lodging is available in Weiser, Idaho and Baker, Oregon. While you are on your way to see the UP in the Blue Mountains or trains racing up and down the Columbia Gorge, stop and watch the show in the Burnt Mountains! Hood River resident Dan Schwanz, when he is not trackside at Maryhill, works with the public transportation providers in Hood River and Wasco Counties. Interested in railroad photography since 1970, Dan still finds the hobby fascinating and interesting. A frequent photo contributor to NWOR, this is Dan's first byline. Dan can be reached at schwanz@gorge.net, and more of his photos can be seen at his site, Dan's Northwest Trains.